Edgar, an 8-week-old kitten in a Pasadena shelter, needs expensive surgery for a congenital heart defect to save his life. PASADENA, Calif. -- Edgar the kitten needs help. Veterinarians discovered the 8-week-old kitty has a congenital heart defect and likely will die if he does not undergo expensive surgery. The Pasadena Humane Society & ASPCA is looking for donations to help pay for the surgery, expected to cost around $4,000-$6,000 not including post-surgical care. Edgar was brought to the shelter with his mother when he was just two weeks old. He was going to be adopted and was undergoing neutering surgery when the medical team discovered his heart defect, and the family decided not to adopt him. 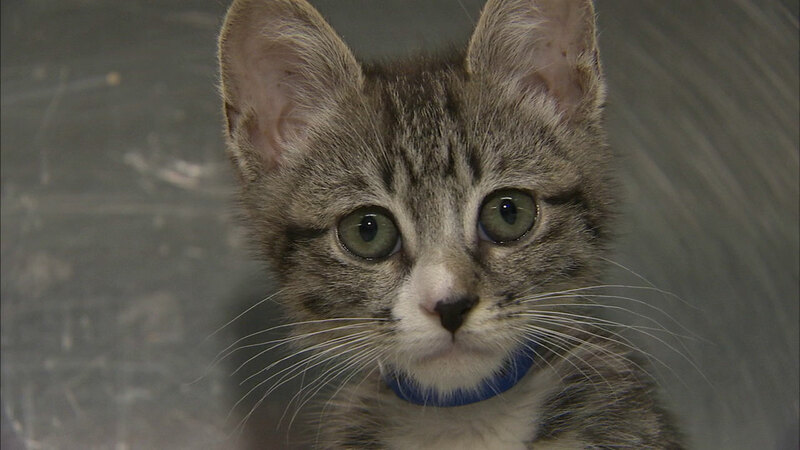 "We started looking into this medical condition and realized that it's something that needs immediate surgery or the kitten will not survive," said society CEO Julie Bank. "This little guy we decided deserves the chance of life." The organization recently started the Miracle Fund, to help animals that have been injured or abused or are in need of medical care. The fund is named for a puppy named Miracle who was injured by a car in a hit-and-run. "Our goal is to save their lives," Bank said." We want to go above and beyond for these animals. And we're hoping that the community is going to help us do that by donating to the Miracle Fund."